flying dog software develops intelligent solutions for Internet,Intranet and Extranet since 1997. Our software ranges from Enterprise Content Management to Business Process Management and Social Intranet solutions. Our customers are well known companies and organizations of all sizes in a wide range of industries like BOSCH or Telefónica. You praise the three-letter acronyms OOP, MVC, GIT and PHP! Deep Learning bei flying dog im Jahr 2017. Spannende Projekte von Bilderkennung bis hin zur Textanalyse. Bringing card design to a new level. Our flying dog workflow engine with the associated administrator desktop is the process management solution to get your processes quickly and efficiently into the Intra-, Extra- or Internet and have them ongoing and sustainable optimized. Effective process management increases the productivity in the interaction of employees, customers, suppliers and partners and is essential to succeed in an ever-changing market environment. The processes are designed comfortable in your browser using a modern graphical process designer. Here you create nodes and edges and link them with events and actions. Frequently used actions are available in library which is simple extensible with custom ones. Forms used in the process can be created without programming skills web-based in our form designer. The required form elements are simply selected from a list. For each element you see the assignable attributes. The order can be changed with drag and drop. The Robert Bosch GmbH business unit Automotive Electronics in Reutlingen Germany relies on our products in several projects. As a supplier to the automobile industry Bosch develops and manufactures control devices and sensors for cars. Testing the sensors for durability is a complex process that can involve up to 200 individual tests. A Powerslave ECMS based solution supports the engineers in planning, procedure and documentation of the testing. This solution has been developed and implemented by flying dog software in close cooperation with Bosch. The former HanseNet Telekommunikation GmbH (now part of Telefónica/O2 Germany) supports and manages processes for maintaining and developing the technical infrastructure with a bundle of Powerslave ECMS and Enterprise Workflow Engine. The solution consists of several modules. In the change and resource management change requests for works on the networks are created, planned and documented. Change and release projects summarize several change requests with logical and temporal dependencies. A special database records current operational disorders and triggers if necessary escalation processes. Planned works on the infrastructure by partners are also included. A Gantt chart combines all this information. 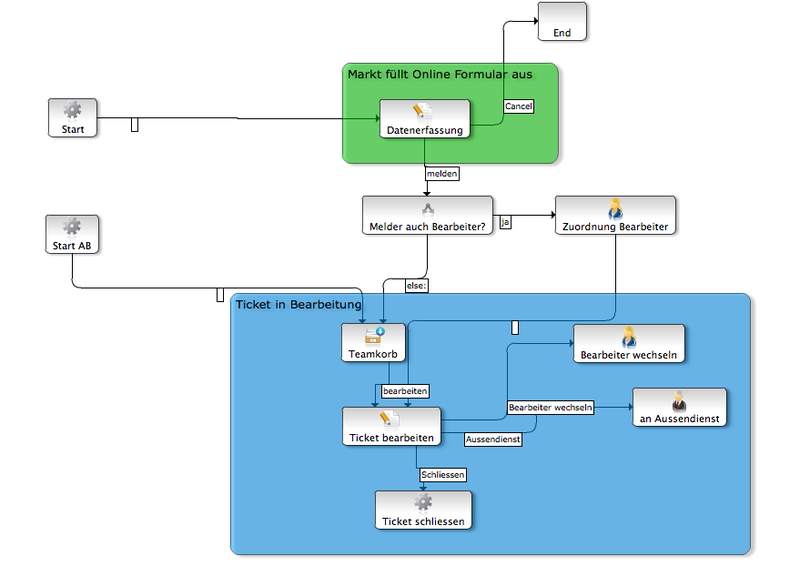 The German supermarket chain coop eG uses the flying dog BPM system for many processes with thousands of people. 250 stores are supported and an existing Support Desk solution was replaced by the flying dog Helpdesk and enables now a more modern and faster environment . The state of Lower Saxony relies since 2003 on products from flying dog software. As a start several intranet projects have been realized based on Powerslave ECMS and Enterprise Workflow Engine. The intranet portal provides applications and information for all authorities. A groupware solution is used for information exchange of interdisciplinary project groups. The intranets of the different authorities and departments are implemented as clients.